It’s a translation of some parts of the interview with Oleg Vasiliev by Andrey Simonenko. Here’s the link to the original interview on Russian. Oleg talks about his work with Vera Bazarova and Andrei Deputat, struggles they’ve faced at the beginning of the season, competition in the group, quad throws, even about Patrick Chan and Yuzuru Hanyu. Oleg: Russian Cup Final was an intermediate point in our plan. Guys skated there reasonably well, considering that a week before Vera got a flu. They dealt with almost all of the tasks if not 100%, then 90+%. After the free program CEO of Russian Figure Skating Federation Alexander Kogan proposed us to go to a B competition in Austria in mid-March, which is useful for us to get rating points. So, we are preparing for this competitions. Time will tell will it be the last start of the season, or we will have something else, anything can happen. We are all human beings, and the ice is slippery. Are you satisfied with the pace of their progress? Oleg: Last season was very hard in terms of progress, in my opinion, it was zero. We tried very much, but the result was always one or two steps below than we would like. There were many reasons for that, but there’s no sense to talk about it. The current season started promisingly. We had a very productive summer camp in Saransk. After working there for three weeks, we arrived to Moscow, full of strength, with good programs and elements. But in late July, Vera crushed with little girl at trainings, fell and then started a run of bad luck. Problems with back, with the coccyx, with something else. All the potential that we have built in Saransk, vanished. In September we took part in control skates, where performed quite good considering the situation in which we were. Then, before our first Grand Prix in Canada we went to America and settled on an acclimatization camp in Chicago. We lived in the house of my former students, and there by coincidence Vera slipped on the carpet, fell, and rolled down from the stairs. It’s unpleasant even for normal people, but her problem with the coccyx is extremely aggravated. Oleg: I worked in Chicago long enough and I got a lot of acquaintances, friends including physicians. I called one of them and took her to the clinic and in the evening she felt fine. Moreover, since the doctor is not only a chiropractor but a nutritionist too, he gave her a series of recommendations. Vera began to apply them when we returned from the competition, and our training have acquired a completely different connotation. She began to work on 100% at each practice. And we were able to make serious steps, which gave the result at the National Championships and Russian Cup Final. If the pair will be able to progress at the same pace, I think their near future will be very good. They are “hungry” to victories. In one interview you said that it is impossible to make progress without sparring partners. Oleg: Of course, sparring partnership helps, it’s a daily internal competition, a mini-competition at each practice. Unfortunately and fortunately we don’t have such. Unfortunately – because I know it works. Fortunately – because sometimes sparring partnership brings difficulties. The medal is one and sparring partner also wants to win it. Such situations are not always easily resolved. Any diamond requires individual cuts, and you can not make masterpieces on flow. Sparring partnership raises the level of mastery, but personality is forging one-on-one. To prepare the pair for the fight at European and World level requires more personal work with each athlete. Over the past couple of years, when you have been already coaching Vera and Andrei, did someone else ask you for coaching? Oleg: Yes. But there is no place for this, we skate like “guests”. “Medvedkovo” it’s not our ice, we can skate here because I asked. Officially, we represent Saransk. But my family is in Moscow, and here’re the best conditions for my child. People who rule pair skating in Russia are not interested in any competition, especially in Moscow. Oleg: Competition is always good. It moves the sport forward. Why in our country so many talented girls competing in singles? Because they all have different coaches. Someone trains with Eteri Tutberidze, someone with Inna Goncharenko, someone with Anna Tsareva, and so on and so forth. They compete in different competitions, international and domestic. Compete constantly. And no one decides that in one competition someone participate and someone not. At the Four Continents Championships Chinese pair Sui Wenjing / Han Cong did an incredible quad throw, that could be easily taken as triple, so easily it was done. Is such quad worth the risk? Oleg: On the one hand, yes. It’s beautiful, looks very impressive, effortless. On the other hand, few people know that week before she fell from this throw and hit the left side of the head, just like Natalia Zabijako, who was seriously injured. Chinese skater got blind in his left eye. Now, they skated at Four Continents and her left eye could not see. They decided not to withdraw and then treat it before the Worlds. So, the question is whether such a wonderful and beautiful throw is worthy of these sacrifices? All the falls from this element is very dangerous. In contrast to the quadruple jump in the singles. Oleg: When a single skater do a quadruple jump, he throws his body into the air, he rotates and control the situation. In the throw the girl doesn’t controls the situation fully. Because more than a half of the efforts in this element belongs to the male partner, he throws the girl. And the girl often does not know how and in which position she got in the air. She can guess, but the sensations are not always correspond to reality. That is why a fall from a high and big throw are fraught, because athletes are not always aware what position they have in air. At that angular velocity, height and length of flight laid the kinetic energy that must be implemented somewhere, so if the athlete doesn’t do a landing, she falls. And such falls are very, very painful. And can lead to very dire consequences. Do you consider it necessary to prohibit the quad throw? Oleg: No, I do not advocate restrictions. The sport judges itself. Figure skating it’s an Olympic sport, we live by the Olympic principles, and these principles are as follows: faster, higher, stronger. Just a question, which way will lead to victory: to perform a good triple throw and get more than eight points, or to persist on the quad, which is with brilliant execution is ten and a half? The difference, in fact, only two points. Are the two points worth health? While the quad throws are allowed somebody will always try to do them. Oleg: They always will be allowed. We talked about this with the guidance of the International Skating Union, with the leaders of the International Olympic Committee. We were talking about it back in 2006, when Chinese girl fell and the program was stopped. So, we got a very hard answer: it is a sport. I was thinking all these years and I realized that the missing points can be earned other way. Ksenia Stolbova and Fedor Klimov, for example, do a combination “3-3-2”, raising the base value of the program to almost the same level as the program with quad throw or quad twist. Let’s see which path will lead to victory. 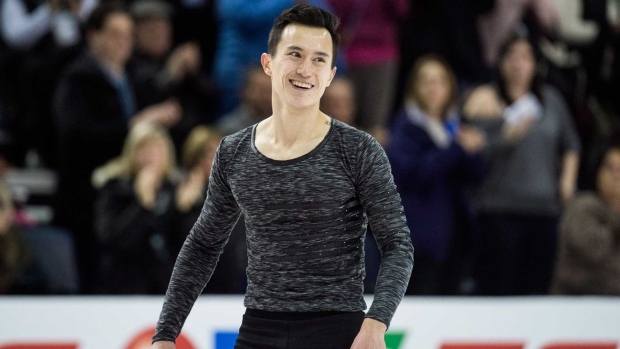 At the same Four Continents Championships Boyang Jin did four quads, but Patrick Chan won, by dealing with the free program, skating last and breaking a personal record by four points. Oleg: For Patrick it was a big victory was not just to win the tournament and set a record, but to skate a program clean with two triple axels, one of them in the second half. He has a psychological fad about this jump. You think it’s unclear who will win the World Championships? Oleg: Unclear. Because such skating, which Yuzuru Hanyu was showing at the Grand Prix in Japan and at the Grand Prix Final in Barcelona, impossible to show every event. It was a miracle that can happen, in my opinion, once a season, or maximum twice. If Yuzuru repeat it again, then we will enjoy his fantastic skating. If not, we will enjoy the fight of monsters. Read also interview with Oleg Vasiliev about Russian women’s figure skating. Ilinykh and Zhiganshin: training or internship?